Just weeks after Docker Inc.’s introduction of a support-rich Enterprise Edition (EE) for its containerization suite, WeaveWorks has debuted an enterprise edition of its Weave Cloud microservices deployment platform, for the Kubecon Kubernetes user conference being held this week in Berlin. The company’s objective, as WeaveWorks’ CEO Alexis Richardson tells us, is to offer a somewhat more guided approach to staging new classes of workloads. 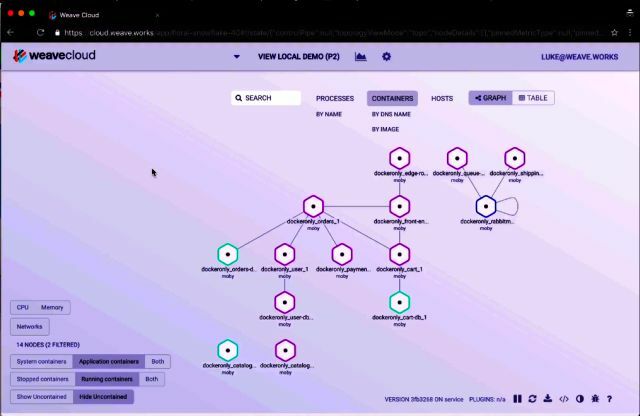 “What we’re finding is, many teams don’t want 100 percent of the logging functionality and 100 percent of the monitoring functionality,” said Richardson, referring to two principal components of the Weave Cloud platform. “What they want is 80 percent, or breadth, rather than depth. Typically when a vendor makes a play for an ecosystem, it presents the customer with an apps store-like array of choices, while giving him the appearance of a virtual marketplace. We saw Mesosphere make such a move earlier this month with its Data Center Operating System (DC/OS). That’s not what’s happening here with Weave Cloud, insisted Richardson. While the platform will continue to support the customer’s choice of container orchestrator (Kubernetes, Docker Swarm, Amazon Elastic Container Service, Apache Mesos, or Mesosphere DC/OS), WeaveWorks will not pretend to be Apple or Google and play like a supporting, or supported, product is like an installable app. “We’re not having a strictly feature-based EE,” he explained. “The thing that enterprise customers want is a lot more hand holding, a lot more certainty around outcomes. They don’t necessarily want to have a ton of new features, because actually, they’re very happy with the features they have in our Standard Edition,” Richardson said. This may not always be the case, he admitted. For now, however, the advances WeaveWorks is touting for Enterprise Edition are actually also being added to Standard Addition as well, he added, minus the added support and a few other conveniences, such as extended terms for long-term data storage. One good reason for these extended terms is a feature being added to both Enterprise and Standard editions for the EE rollout is something that sounds like it should appeal to IT administrators and DevOps professionals: historical audit logging. It’s a way to extend the type of recording Weave Cloud has already been doing, explained Richardson, to make it more functional. With enough cloud-based data storage, Richardson continued, Weave Cloud should become capable of capturing the complete performance history of each application, as it’s running on the customer’s platform of choice. I pointed out that a platform provider might have a difficult time rolling out a feature like “audit logging,” putting an asterisk beside it on the announcements list, and expecting customers to immediately know what the provider’s talking about. Whereas, if the provider instead pumps up the storage limits, and then demonstrates some interesting uses for that new space — like, maybe, for instance, audit logging — enterprise customers may be more likely to sign on. There are two possible approaches here, Richardson responded. The configuration management approach would establish a model for correctness, and then send up an alert when the active configuration deviates from the model. The other way — which Richardson is suggesting for his EE users — is to gather so much detail about the current state and performance of the application, and compare that state against previous states. It’s a less scripted, more database-oriented, approach to managing an application. And although it won’t be suitable for everyone (internally, Richardson admitted, WeaveWorks relies upon configuration management), there may be few enough steps to this approach for enterprises to get a handle on it. This is where we are with containerization in the enterprise, since its architecture now is pretty much set: finding more methodological approaches to making inroads with medium-sized data centers.